In the past few weeks, it seems like everyone on the Internet has been making Alison Roman’s salted butter and dark chocolate chunk shortbread cookies. Cookies are my favorite baked good to make because of their versatility – there is always a twist, an addition, a substitution, or a tweak that can create an entirely new cookie. 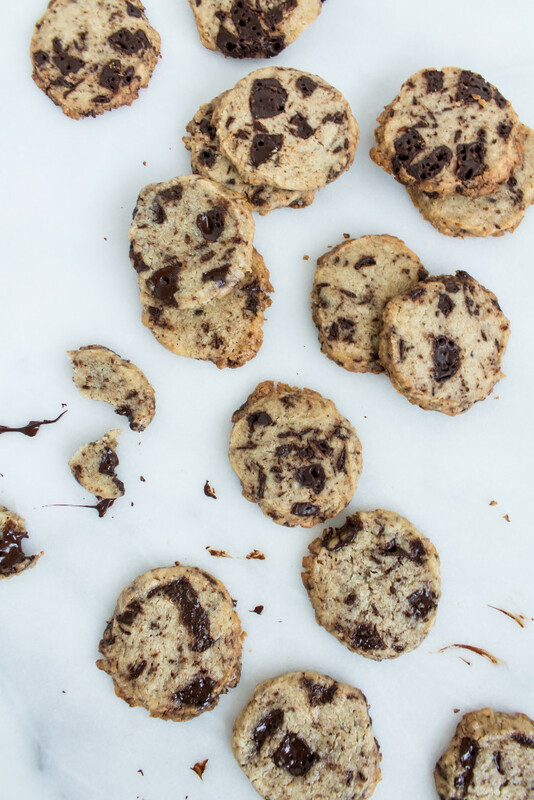 In this case, the classic chocolate chip cookie and the buttery shortbread cookie met for a totally new take on both cookies. 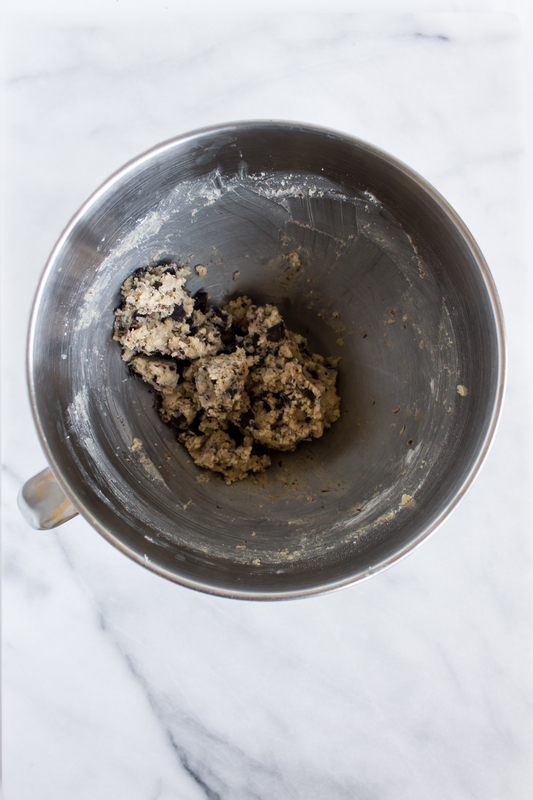 You know I love a good chocolate chip cookie, and I’m always excited to see a new version gain popularity, so I hopped on the bandwagon and got my mixer blending up this famous batter as soon as I could. The result? I didn’t love them. They were good and left me wanting more, but they didn’t beat my favorite chocolate chip cookie or shortbread cookie. I made them again to make sure I was secure in my decision and hadn’t made a fluke batch. After tasting the batter and baking up the cookies again, I came to the same conclusion. They were still lacking a little depth, and I wanted them to stand out on their own, rather than compete with the classic recipes. Into the mixer went another stick of butter, but this time when I added the flour, a bit of espresso powder joined the mix too. To me, this addition was just what the cookies needed. 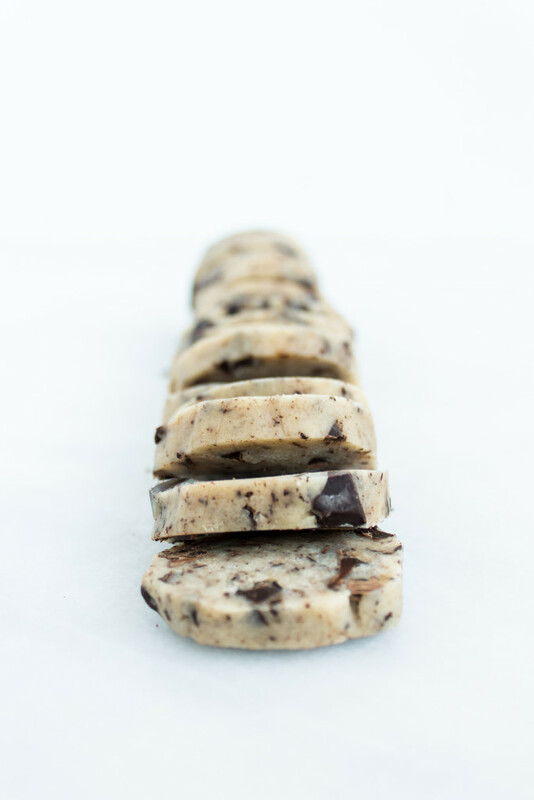 The espresso powder intensified the flavor of the large dark chocolate chunks and increased the complexity of the cookie. 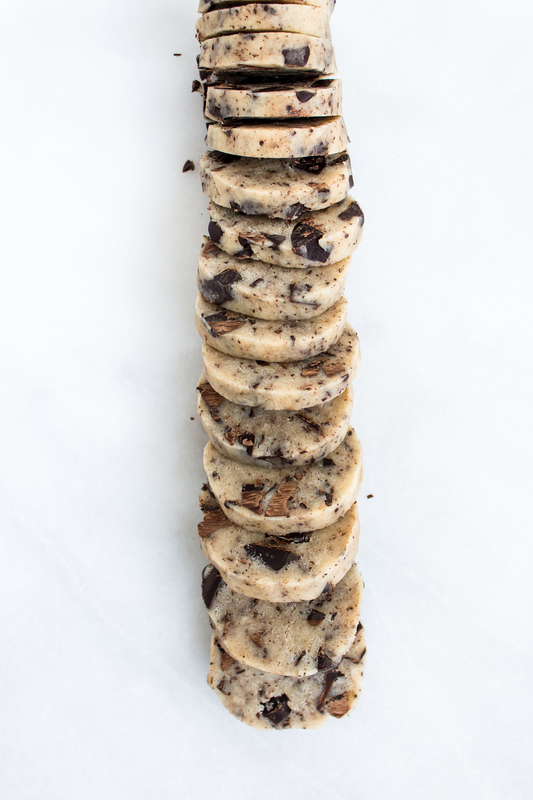 While I felt ambivalent about the original recipe, I went back again and again to bake just one more of these new dark chocolate chunk espresso shortbread cookies. 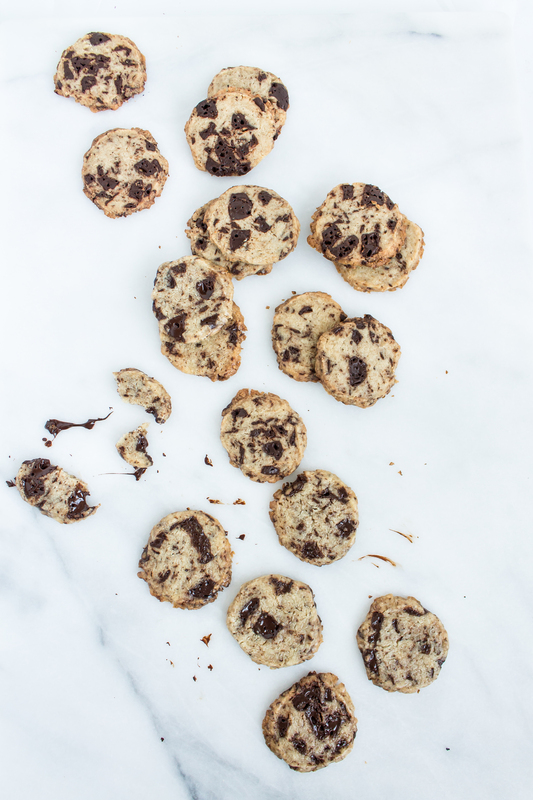 *if you don’t have salted butter you can add ¾ teaspoon sea/kosher salt when you add the flour and espresso powder. In the bowl of an electric mixer, beat the cold butter, sugars, and vanilla until light and fluffy. Scrape down the sides of the bowl then add the flour and instant espresso powder and mix just until combined. Add the chopped chocolate and mix just until incorporated. The dough will be crumbly but able to stick together when you press it between your hands. Divide the dough in half and form each piece into a log shape, about 2-2 ½ inches in diameter. Wrap each log in plastic wrap and refrigerate until completely firm, about 2 hours. Preheat the oven to 350 degrees F. Line a baking sheet or two with parchment paper. Lightly beat the egg and brush it on the outside of the cookie dough. Pour the turbinado sugar on top of the cookie dough and press it into the sides. Roll the bottom in the excess sugar, to coat the entire outside edge of the cookie dough log. Using a sharp knife, cut the logs into ½-inch thick rounds. 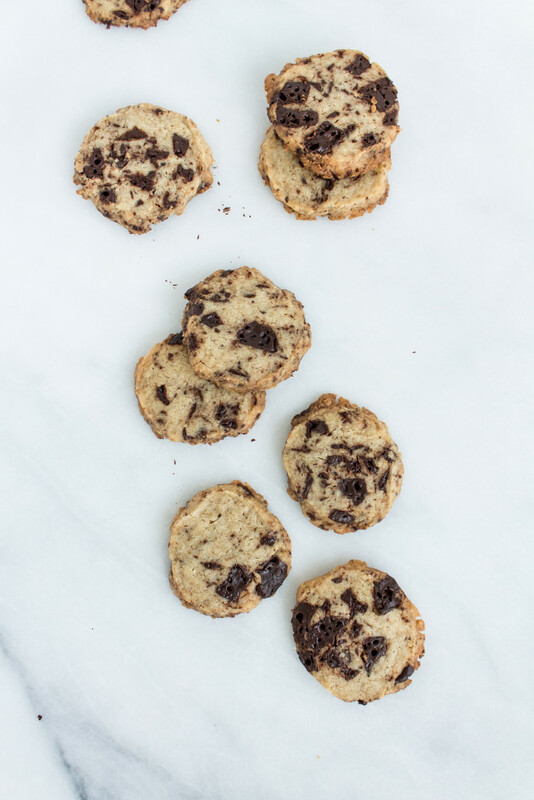 Arrange the cookies on your prepared baking sheets about 1-inch apart and sprinkle a little sea salt on each cookie. Bake for 12-15 minutes, or until the edges are just beginning to turn golden. Let the cookies cool slightly on the pan before moving to a wire rack to cool completely, or to a plate to eat/serve immediately. I’ve read that these keep for up to 5 days, but can’t say I’ve ever witnessed that. To make ahead, make the dough and stop at the chilling step. Keep it wrapped in the fridge for up to one week, or in the freezer for up to one month. When you are ready to bake them, go through the egg wash, sugar and sea salt steps as you would if you were making them fresh. 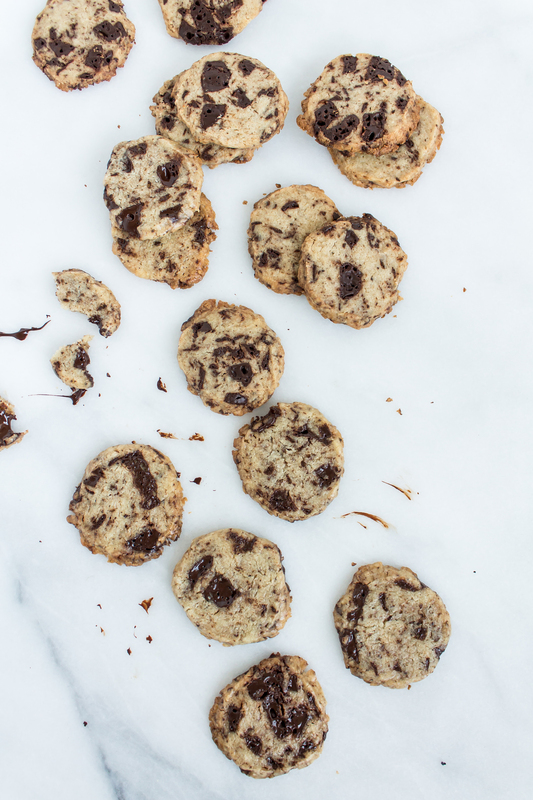 Slightly adapted from Alison Roman’s Salted Butter and Chocolate Chunk Shortbread Cookies.